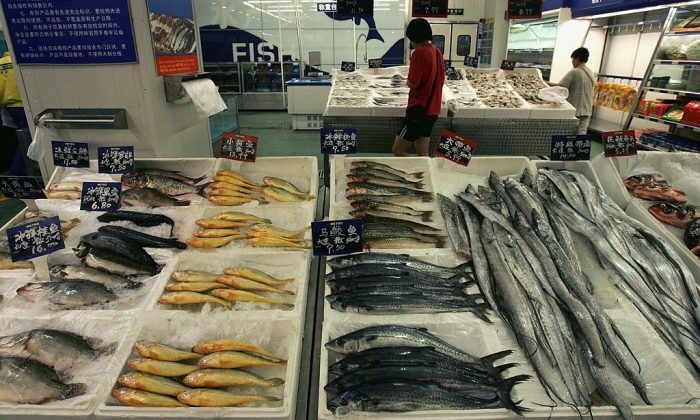 An investigation found that North Koreans were being sent to fish processing plants in a Chinese border town to process fish exported to stores in the United States and other countries. Aldi and Walmart were both identified as sellers of fish using North Korean labor, according to an investigation by The Associated Press. Under sanctions, the practice is illegal. The United States currently considers all forms of North Korean labor slave labor. North Korea takes up to 70 percent of the wages its workers make abroad, and uses the money to prop up the regime and its $1 billion nuclear weapons program. Plants in Hunchun were found using North Korean workers. The North Korean workers aren’t permitted to mix with the Chinese workers in the same factory, and their speech and movements are tightly controlled and monitored. Pictures of the two deceased North Korean communist leaders hang on dormitory walls across from metal bunk beds, AP video footage shows. Experts said China is the worst option for North Koreans working abroad, because of the jail-like conditions. But for North Koreans, a job abroad is highly coveted. Even with the government taking away 70 percent of wages that are already low, they still make a little more money than they could within North Korea. And in a nation where leaving or entering is tightly restricted, taking even a small step across the border is highly coveted. There are about 3,000 North Koreans working in the city of Hunchun. Workers exported by North Korea are exploited for $200 million to $500 million per year that goes back to the regime. Some North Koreans work in Russia or the Middle East, but the majority works in China. The workers are favored by greedy factory owners because they have even less rights than Chinese workers, and often get paid less. They work 12-hour days, six days a week. They can’t take time off, and rarely are allowed to leave the factory compound where they sleep, work, and play. They will be away from their families for years at a time. About a dozen U.S. companies sell fish using North Korean slave labor, according to the investigation. Some of those companies have already cut off those parts of their supply chains, others said they are investigating the matter.